The Ghetto Gourmet was my first gastronomic blind date. The "original underground experience" was set up in Oakland, California by two brothers, a chef and a poet, looking to feed and entertain people in an unconventional manner. They began to put together weekly dinners in their living room, and the movement grew larger and larger. Now events are run across the country and range from intimate gatherings to groups of more than fifty people, usually with food from local guest chefs. 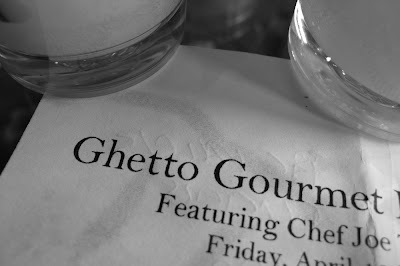 The Ghetto Gourmet has been cited in The San Francisco Chronicle and in Budget Travel magazine, where I read about it. I had to go. Sadly, their only upcoming NYC event had sold out, but I signed up for their newsletter anyways and sent an email pleading for any return tickets. The team decided to have another NYC event, and this one was called GG Roots – back to the roots of the organization, a small dinner for 15 hosted in someone’s apartment with Joe, the original chef, in the kitchen. I signed up online and paid for the $75 ticket online, not knowing where I was going or what I would eat. I decided to drag a few friends along, but couldn’t tell them where to meet me until the day of the event when I received an email with an address and a request to bring a cushion. We found ourselves at the East River, in an over sized dorm-like living room with a view of the water. The lights were low and candles and flowers adorned both the apartment and the low table in the middle of the room that would seat us. We cracked open some of the wine (it’s BYOB) and began to mingle. Initially everyone was quite shy. We introduced ourselves to everyone in the room, but gravitated back to our own little groups quite quickly. This changed once we all sat down at the table. The food did not disappoint. The flavours in every dish married very well, the combination of textures was considered (particularly in the beef tartare) and there were many things that stood out in my mind. The hawaiian red salt with the beef tartare was delicious, the blue cheese was an outstanding choice, and one I've never had before (called Roaring Forties, from Australia) and the pork tenderloin was perfectly pink in the middle, a tribute to the chef and (hopefully) to the quality of the meat he was serving. The cheese plate was a creative combination of mini toffee apples, cheese, berries and cotton candy with sprinkles, and Joe encouraged us to try the sprinkles with the cheese - an unlikely pairing, but actually really good. The only complaint we had was that the potatoes in the potato salad were slightly undercooked. We had a quick break before the pork tenderloin course for a game, a story about the community that has evolved out of Ghetto Gourmet and for a little massage circle to break down barriers further. Everyone was a good sport and participated, perhaps thanks to a few glasses of wine. Massage is not the first thing you expect to do with a room full of strangers, but you don’t come to an event like this without an open mind to begin with. Overall the evening was a little like eating cheese with sprinkles - not something you often do but it actually turns out quite well. We ate excellent food and got to share it with some interesting people – a publisher, pharmacist, dancer and architect among them. I’ve been looking out for more opportunities like this. A similar New York venture has begun called Homeslice West, what they call a “culinary speakeasy” aiming to bring people together over a modern take on Southern food. All meals include a signature cocktail and homemade buttermilk biscuits with honey butter. Yum. There is also The Whisk and Ladle, a supperclub based in a Williamsburg loft. Their logo, like Ghetto Gourmet's, is based on the skull and cross bones, but from their website the premise is much more classic. They host meals based on the "traditional structure of a dinner party" with dishes such as salmon poached in white wine with shiitake mushrooms. So far I don’t know of any similar things going on in London, but I suppose that’s the point. They’re underground. What I do know is that after the success of our first date, I’ll be seeing Ghetto Gourmet again. I just have to find an event that's not sold out. I must admit I was slightly proud to see an article about fellow food blogger, Clotide Dusoulier, in The New York Times Magazine this weekend. Dusoulier's blog "Chocolate and Zucchini" is a showcase for her passion for food as well as her idyllic life in Montmartre, Paris. Following in the tradition of her quartier, her recipes are creative and sometimes verging on the avant-garde (Broccoli and Apple Quiche). Her blog is is so wildly popular that she has written a book of the same name that will be released May 15. I can't wait to buy it for the Apricot and Pistachio Ricotta Cake recipe alone. Perhaps you have suffered from it too? Chocolate anxiety; that feeling I get when I want to make the perfect creation of chocolatey goodness can’t find the right thing to make. The dreaded feeling happens most just before birthdays or parties. It helps to know that I am not the only one; according to Julia Moskin’s article on brownies in the New York Times, she suffers from the same thing. The quest for chocolate perfection. I agree with Moskin on many points. I think it’s true that we have become too chocolate obsessed. No dessert menu is complete without death-by-chocolate this or that, or at least one of those omnipresent melt-in-the-middle warm cakes. I like them, don’t get me wrong, but enough is enough. And I am not the first person to feel this way – one-time chocoholic friends have said to me they are now happy to turn away an oozing cake for a fruit tart or crème caramel. But some occasions still call for cocoa and brownies, as Julia points out, are the ideal fix for the home baker. 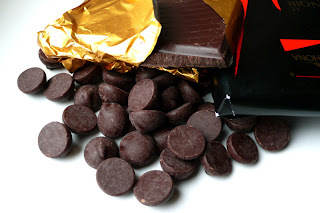 They are reliable, as long as you get the cooking time right, and they almost always satisfy the desire for a rich, dense, dark chocolate treat. How could you go wrong? Julia takes offense to any additions other than walnuts and pecans. Though I agree that peanut butter, marshmallows and other flavourings are generally over the top, I must say that I often like nuts in my brownies. The bakery at St. John, in London, does a very fudgy version packed with brazils, almonds and hazelnuts (or at least from what I can identify) and it never fails to amaze me how well the flavours and textures meld together. At once dense, smooth, crunchy and soft, the nuts retain some of their natural character since they aren’t crisp and toasted. My absolute favourite brownie, the one that I recommend to people the most, in fact the one that I make people try when walking past the store no matter what protests they throw at me, is the Boston brownie at London’s Konditor and Cook. This bakery has never failed me – everything I have ever bought there has been scrumptious - but their brownies are more than delicious; they are original and superlative at the same time. They are the best brownies I have ever had and at the same time different to any others I have tried. The key is the Bostonian element: the cranberries. Their occasional tanginess cuts through the richness of the chocolate and brings out the dark flavour at the same time. The cranberries are not overdone, in fact there are only a few in each brownie, but they make all the difference. Unfortunately I have not been able to get my hands on the Konditor and Cook recipe, but I will try. 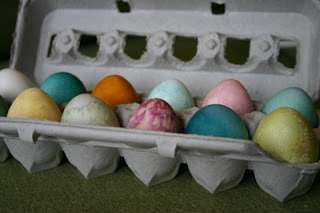 And if I don’t succeed, I will try my hand at recreating them next time the chocolate anxiety comes around. They could be just the thing for it. The torrential rain that hit the Northeast yesterday did not keep me from enjoying an otherwise perfectly good Sunday. We met friends for brunch at Barney Greengrass on the Upper West Side and then headed to MoMA for some cultural stimulation. Barney Greengrass was a NYC favourite of mine before I even moved here. I liken this institution and another old-school Jewish stalwart, Schwartz’s in Montreal. In my four years of studying in Montreal I tried a lot of smoked meat, but nowhere drew a comparison with Schwartz’s quality or atmosphere, and I feel the same way about BG. It’s simply a really enjoyable place to eat fantastic smoked fish. The staff are understatedly hilarious, friendly and efficient. The restaurant and store don’t seem to have changed for years, and they don’t need to - the art deco cabinetry and kitsch wallpaper are part of the attraction. Most of all I love the sturgeon and Nova Scotia salmon platter (Barney himself was, after all, "The Sturgeon King"). For about $30, it comes with a couple of bagels or bialys and enough fish for two to share. It's just what you need to set yourself up for a long Sunday in the city. My brother says he would fly to New York every weekend just to have some sturgeon (he's also fond of Schwartz's). Now that I’m living here, it’s going to be hard to convince myself to go anywhere else. Luckily both Barney Greengrass and Schwartz's have been around for some time (99 and 79 years respectively), so I doubt they'll be going anywhere soon. The highlights at MoMA were classics of a different sort - a display of design classics and how they have influenced other products. My favourite were the Wilhelm Wagenfeld's Kubus Stacking Storage Containers (1938) (right), clever and practical square glass containers that are a perfect marriage of form and function. They were paired with Constantin Boym and Laurene Leon Boym's Use It Containers (1995) (left), a modern system with clear similarities to Wagenfeld's Bauhaus product. With both systems the variety of sizes ensures that you always have the right size for the job, and you can pile them high on the counter or in the cupboard to save storage space. I used to bring a packed lunch to school, and the best days were always when my mum put something extra special in it - a joke or a note, some chocolate or some unusual fruit. I was reminded of this when my mom sent me an article from the Guardian about Mimi Ito's bentoblog, an online photojournal of her children's lunchboxes. These aren't just any lunch boxes. They are impeccably organized bentos along the lines of the traditional Japanese boxes, but filled with a mixture of Japanese and American foods and with an emphasis on fruit and vegetables. As they say in the article, it's hard to believe that her children eat so many vegetables, but I can see the appeal of the presentation to children. Lots of little compartments, each with a different treasure. I just wish someone would make me a bento box every day, but I will have to live with my bento envy for now. When I went to Pinkberry last night I felt like a child who didn't quite get what they wished for for Christmas. It's as if I asked for an all-singing, all-dancing battery operated doll and received a "true to life" plastic doll instead. Still a nice present, but not quite the indulgence I was looking for. Pinkberry has nice wrapping, as I suspected. The store is lit with what look to me like Le Klint pendant lamps, and, as I mentioned before, there are Philip Starck ghost chairs which lend an air of regality. Slightly incongruous were the Alessi kitchen gadgets lined on shelves, although they may have been for sale. I didn't inquire. The interior design and the quality of the ingredients (fresh, not frozen, fruit and a good choice of other sugary toppings) were betrayed by the presentation of the toppings and the finished product. The fruit is kept in small sunken storage bins just as it might be at a sub sandwich chain. My cup definitely did not look like the perfectly coiffed swirl on the website. As you can see, the fresh, firm berries were jammed on top of the yogurt and had none of the artful placement that was advertised. But more importantly, how does it taste? Well, it tastes healthy. It has the sourness of a more acidic yogurt and is lacking the creaminess of unctuous Greek yogurt because, well, it's non-fat. The cookies-and-cream and raspberry toppings I had were a perfect crunchy and fresh antidote to the sweet-tart frozen yogurt. Although there seemed to be an equal distribution of consumers of the plain and green tea flavours, we tried the green tea and weren't terribly impressed; it had a loud green tea after taste but was very watery at first. As my companion said, "it's not as good as ice cream," but the comparison is probably unfair. I wasn't expecting ice cream, but I was expecting something better than other frozen yogurts I've tried in the past, and this just wasn't it. Yogen Fruz is still top of the list. Now they just need to open one in NYC. I can’t wait to try pinkberry. A friend told me that it has taken SoCal by storm – to the extent that it is bothering him that people won’t stop talking about it. Apparently everyone says their frozen yogurt 'really tastes like yogurt'. I’ve got to try some. I didn’t even know that it existed, let alone that there are three branches in New York. I already have a soft spot (excuse the pun) for Yogen Fruz, so let’s see how pinkberry measures up. From what I can see on the website the décor is definitely a step up from the Fruz's, including Philip Starck ghost chairs. Not too shabby. What came first, the cockatoo or the egg? Although I love my eggs, the most heart-warming egg-related squib of this Easter comes from the BBC. Check out their story about Pippa, the cockatoo, who mistook some Cadbury's eggs for her own and has been guarding them for the past two weeks. Gorgeous. Moving to New York was a shock to my system in more ways than one. I left a great job, fantastic friends and family and the familiarity of my beloved London. It takes a lot of time and commitment to get to know a city like London or New York, and I feel like I was nearly there. I’ve exchanged easy weekends of wandering around old haunts for the buzzing opportunity of this manic city. New York affords some wonderful conveniences: shops open 24 hours a day; the subway running through the night and every service you could possible ask for. Gastronomically it is rich, diverse and eager to please. My biggest difficulty is narrowing down the choices. One of the best tools I’ve found to acquaint myself with the food scene here is the Manhattan board at Chowhound. Members post and answer any kind of question relating to groceries, gourmet shopping and restaurants in Manhattan. Non-members can search previous questions and answers to find out what people have to say about a particular restaurant, area or cuisine. It’s the ultimate online support group for those wondering about trying something new in the city. The outer boroughs have their own board too - in fact almost everywhere on earth is represented by one board or another. Most of the advice I have read has been spot on, and if in doubt, you can cross reference a variety of posts. Just keep an eye out for the most recent information.